The VNA's innovative Telehealth Home Monitoring program is designed to help patients with frequent ER visits or re-hospitalization to receive treatment in the comfort of their home. The program also serves newly diagnosed cardiac patients, those with unstable cardiac conditions and others. The goal is to reduce trips to the hospital or physician. A number of vital signs can be taken from a patient including: blood pressure, oxygen saturation, pulse rate, weight (up to 450 lbs), peak flow and blood glucose. 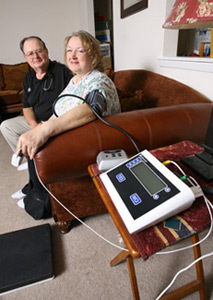 The patient transmits their results to the VNA for review daily. Patients can be referred through VNA of WNY’s central intake office at (716) 630-8000. The cost of the unit is covered by the VNA of Western New York while under an open case. Private pay options are also available.